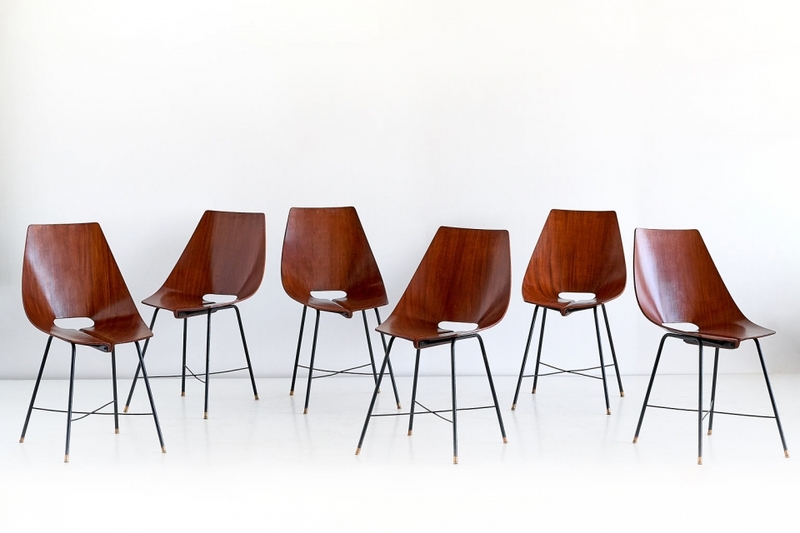 This rare set of six dining chairs was manufactured by Societá Compensati Curvati in Monza, Italy in 1959. The chairs feature a plywood shell seat mounted on a black metal crossed base. This striking design was numbered model 127-B by the manufacturer. Sometimes attributed to Carlo Ratti and similar in style to Vittorio Nobili’s Medea chair, the chair was manufactured by as the name suggests a company entirely specialized in the production of curved wooden products. This made more elaborate techniques possible, such as the inward bending wood, avoiding any visible screws on the seat. References: Domus 359, October 1959, page 122. Condition: Good. Restored and refinished. Five chairs are in a very good restored condition. One chair is in a good restored condition with visible restorations to the veneer.